Since it’s Friday, I’m taking some liberties with today’s post. Every so often, I check out The Onion and I always find myself laughing at some of the stuff they come up with. I especially like the Apple “news” because it’s so easy to make fun of almost everything they do! Because of this, I decided to search their website for anything Apple and came up with the 5 I liked most. March 2007 – Apple launches the iLaunch—a revolutionary product that revolutionizes how innovative technology is unveiled. For the low price of $12,000, you too can have a product-launching product that launches your product with almost no human interaction! Steve Jobs’ new product is poised to take down any other competing product-launch product with features such as automated keynote creation and presentation, the saving of a significant product feature for the end of the presentation to WOW audiences and its simplicity. Jobs said it’s so easy, “Even an intern can use it.” Read more about iLaunch. February 2011 – Finally you can now cut off your hands (or even just one) and install the latest prosthetic appendage from Apple! This new revolutionary device will revolutionize how you use your hands. You can now hold simple, light-weight objects, wave to your family and friends with ease and give high-fives to other Apple fans. Later models will allow you to write and poke people on Facebook. Hackers have already stepped in and are looking for ways to allow the iHand to display the middle-finger gesture should the need for that arise. 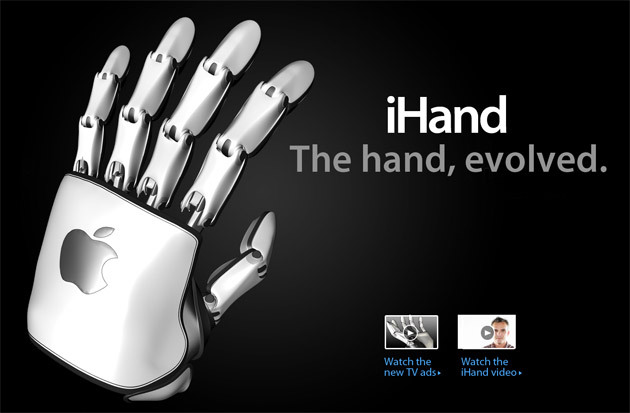 Read more about iHand. Watch the iHand video. July 2009 – It’s about time, loyal Apple customers! You can now get the new iPhone 3GI—the new iPhone that’s only visible to you…the real fans. That’s right, non-dedicated Apple customers and other device owners will be jealous beyond normal levels when you walk into the room with the new invisible iPhone. According to Apple, the screen resolution is the finest ever made for a phone. The new iPhone 3GI comes in black, silver and white. Features include the ability to run dozens of simultaneous apps at once, never a single lost bar of signal strength and one-tap video editing using Final Cut Pro. Again, the phone is only available to those who believe in the company more than anything else in the world, and who would never, ever dream of questioning it. Read more about iPhone 3GI. July 2010 – As an addition to the already popular Genius Bar available at all Apple Stores, the Friend Bar offers a special place for Apple fans to sit and chat with Apple experts about the latest technology and how they use it. You can discuss anything from how Safari is superior to Firefox to how much time you spend editing skateboarding videos with iMovie. If you can’t get your fix during store hours, Apple has also setup up the Friend Bar to be accessible 24/7 via a toll-free call center. Apple has already announced they’re going a step further by offer the iStore, a $6,000 product that allows you to setup up your own miniature Apple Store inside your own home. Other fees include the monthly salary for your personal Apple employee as well as any products you purchase from your store. Watch the Friend Bar video. February 1999 – For years, Apple has touted their superiority using slogans like “Think Different”, but for one Apple employee, doing just that cost him his job. Brent Barlow was one of the unfortunate individuals to learn the hard way that thinking different at Apple was only for the customers. 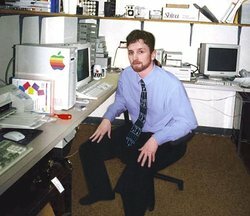 He was fired after heavily modifying his workspace including the installation of hooks above his desk to hang a mountain bike, using an unapproved desktop image featuring Jim Henson and replacing the familiar Apple startup sound on his computer with that of a portion of “Imagine” by John Lennon. Barlow has stated that the personalzation of his workspace has inspired him to “think outside the box”, but his boss responded, “If he wants to think that different, he can do so on his own time.” Read more about Brent Barlow. Visit TheOnion.com for much more tech news and have a few laughs at the expense of the industry.